Once you’re up at 7 am, you’ve got a lot of time to do even more. So, here are a few of our favorite new ways (some are hot off the press in just the past few weeks) to get help from Google by just speaking. 1. Turn on the tunes. Whether you’re the DJ at the holiday party or just chilling by the fireside, Google can help. Ask to play music from a specific artist, for your general mood (“party music”), or for the activity you’re doing and you’ll be taken to a curated playlist on Google Play Music. Or, if you want Google to play music from another music app, just specify where (“on Spotify”). 2. Switch off. 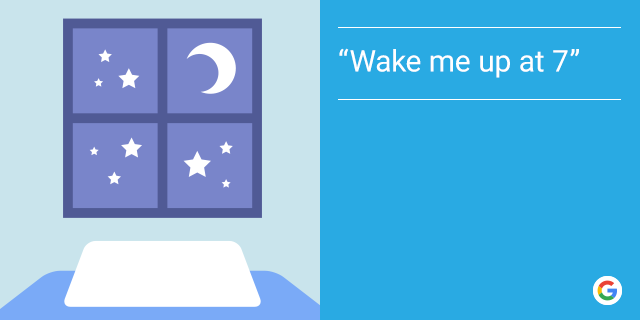 You can still ask Google to get things done for you while offline. You can still ask Google to do things for you when you’re offline – or just having a bad (connection) day. Play music, turn up the volume, open apps, dim the screen, or switch Bluetooth and airplane mode on and off. 3. Ask Google to find and play videos on YouTube. When you’re in the YouTube app and enable Google to recognize when you say “Ok Google” from any screen, you can use voice actions to find what you need, pick out the video you want from a list, skip and more — all hands-free. 4. Book your holiday flights. The holidays have crept up on you and you haven’t nailed down your plans yet? Ask Google to show you flights, destinations, and prices; then finish the booking on your preferred website. 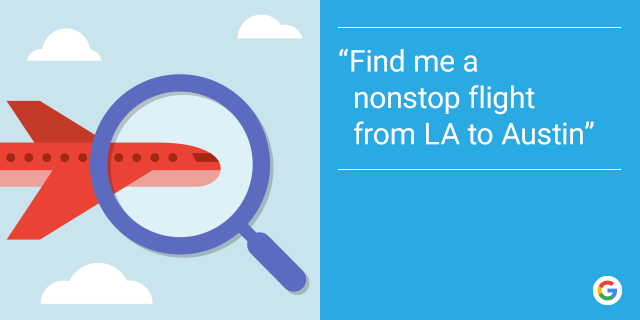 And don’t be shy — ask Google follow-up questions to compare flights on different days and different times of day. Find a nonstop business class flight or one that connects through a specific airport. 5. Get things done in other apps. Voice actions don’t just work within Google’s apps — we’ve worked with a handful of partners this year to create custom ways for you to command some popular apps. For example, ask Google to “Shazam this song,” “Log 400 calories for lunch on Lose It,” or even “Find a hotel on Orbitz.” Hungry for more? Get some inspiration here. Let’s face it: tapping and typing doesn’t work when your hands are covered in flour or pasta sauce. 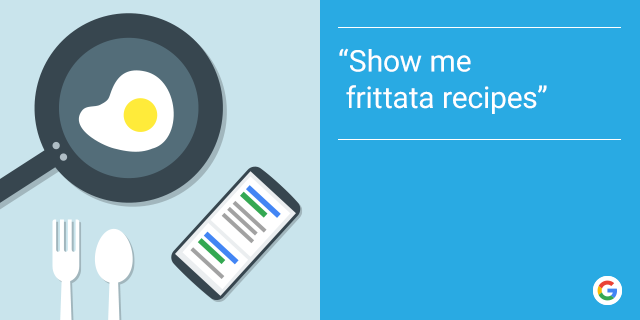 Try asking Google to find you that recipe you’re looking for by voice, so you can finish off your delicious frittata -- without covering your phone in egg yolk. 7. Be vague. Speak human. We all make mistakes, Google included. If the Google app transcribes something you said incorrectly, say so! You can either spell the correction out, as in, “no I meant W-A-L-E-S”, or suggest a word be replaced entirely: “what about dolphins?”. Talk to the Google app as naturally as you would if it were human -- it’s designed to understand conversation that way. We’re not done building out voice features just yet! If you’re ever curious to learn more tricks, just take a look here to learn about everything you can ask the Google app. You can talk to more and more of your tech gadgets today, whether it’s your phone or your watch or your car or your TV or … you get the point. For the Google app, that includes things like calling, texting, setting reminders, and for a lot of you, setting your alarm.